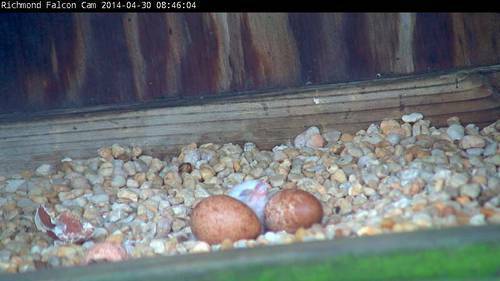 The first of the three eggs in the clutch has hatched. 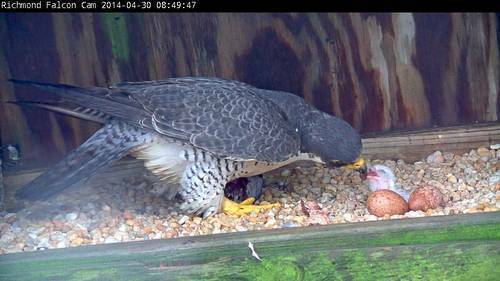 The mother falcon was seen in incubation posture this morning at 8:55, with the fragments of an egg lying nearby. Shortly afterward she departed the nest box, giving a full view of a fluffy white chick next to two seemingly intact eggs. The dry appearance of the chick’s downy plumage indicated that it had probably hatched at least a few hours earlier. The female returned moments later with a dead pigeon, which would have been hunted and provided by the male, and proceeded to feed the chick what may have been its first meal (see video below). 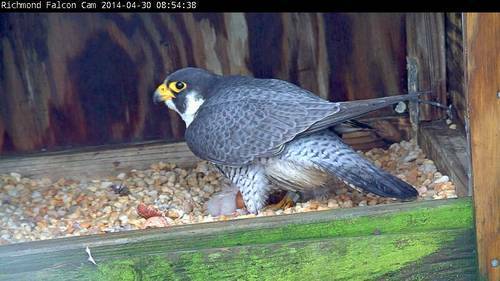 She left the nest box shortly after, prompting a brief visit by the male, before she returned to continue incubating the remaining eggs and brooding the chick, which for its first 2 weeks of life will not be able to fully thermoregulate on its own.